"Many Filipinos are what I call Sunday-religious, that is they go to church every Sunday, take in confession and communion, but the rest of the week they bribe and do corrupt deeds..."
ADDENDUM: Hello! for months/years now, the corruption investigations against Vice President Jejomar Binay occupy the news headlines in our homeland. Throw in social media too. Given our history of continuing political past, we ordinary citizens in the street are left out only to fume, to vent out, to uselessly speculate and be given another ride by highly and possibly of "thieves accusing fellow thieves" in our halls of Congress, ad nauseam. We native citizens --especially us so-called educated ones-- deserve such a show and national predicament because we do not know our own selves; and worse, probably do not even appreciate the need to know and understand. So we go our usual merry ways. In recent weeks, we have been witnessing a lot of emotional release from anger/disgust shown by fellow native Filipinos about the pork barrel, euphemistically renamed PDAF, scams and more recently in the week past, the alleged bribery for helping impeach Supreme Court Justice Corona via President Noynoy Aquino’s Disbursement Acceleration Program (DAP). Let us hope and work for more consistent and persistent pressure by an aroused Filipino citizenry to ensure something truly effective, in the short-and-long terms, and encompassing actions to happen. That is, for us native Filipinos not to let these protests in the streets, in social media, etc. devolve into another of our typically repeated "ningas kugon" reaction. As we have allowed this kind of popular outrage to fizzle out like any fad so often throughout the past two generations. Throughout our political history, from the small town to provincial; from provincial to regional to national politics, the corresponding governing elite/politicians --identified usually with the corresponding socioeconomic elites-- covertly and overtly employ illegal and socially immoral pre-and post-electoral practices for systematically maintaining and reinforcing their wealth, political power and influence. "pork barrel" system - Filipino legislators are allocated large sums of the annual budget (200 million pesos for each senator and 70 million for each representative). Pork-barrel is now euphemistically renamed as a program called the Priority Development Assistance Fund (PDAF). That's why candidates see these porkies in their electoral expenditures as worthwhile investments and rationale for using the 3Gs. the alleged Php 50 million (or more) bribery to each of 20 Senators who voted to impeach Supreme Court Justice Corona via President Noynoy Aquino’s Disbursement Acceleration Program (DAP). Remember Justice Corona ruling for the tillers against the Aquino-Cojuangco clan’s Hacienda Luisita and thus earned the ire of the latter bloc. the awards to rent-seeking political supporters , moneyed connections who either are or want to be in business and obtain unfair advantages against any competition, as described in so-called Booty Capitalism or Crony Capitalism, etc. All or some of these practices are not particular to us native Filipinos, as they occur throughout the world. However, they are uniquely dominant throughout our local and national political lives; and the overall consequences of which make our country to be described as a "soft state"” or "weak and failed state." that is, the common/public good being ignored and neglected. The "old" pre-martial law oligarchs --mostly feudal/landed aristocrats, the Marcos-created oligarchs,and other more recent ones who benefited from the subsequent presidencies of Corazon Aquino, Fidel Ramos, Joseph Estrada, Gloria Arroyo and now Noynoy Aquino would continue to thrive, remain and grow stronger (including these presidents themselves, their kins, cronies and politicized military supporters). The reason being that the existing old oligarchs accept these new ones, regardless of the latter's publicly known thievery from the government coffers, thus providing so-called legitimacy to these public criminals. For how can these oligarchs condemn people who emulate, behave like them, would like to join and be among them, by hook or by crook? 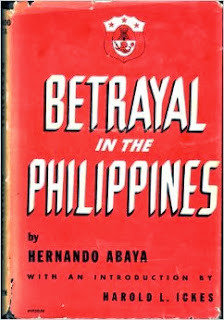 Hernando J. Abaya wrote the first book "Betrayal in the Philippines" (1946) on post-WW2 presidential graft/corruption and deceit (including the wartime collaboration with the Japanese) committed by Manuel A. Roxas. The respectable, former Senator Jovito Salonga has written books on presidential plunders by Ferdinand Marcos and Joseph Estrada. I have not found yet/wonder if there were other books on presidential plunders in our homeland. Due to the unquestioning acceptance by the old, and new governing and non-governing elites and by our so-called educated middle class --who are usually employed by the elites; and the inutile ignorance of the masses (since they are busily struggling for daily survival) we native Filipinos have extremely short memories and wittingly or unwittingly assure that such history will repeat itself... endlessly. BTW, let us not forget the Chinese taipans and other foreign businessmen who reside in the homeland, also heavily profit from this messy state-of-affairs, which inadvertently or in cahoots with those natives in power, quietly laugh their way to their banks while we natives protest in the streets. These taipans control and own several of the largest Philippine banks and practically our national economy and have even taken over a number of our schools, colleges/universities; giving them greater capability to pontificate, influence and further weaken the Filipino mind to their advantage while simultaneously running them as corporate profit centers. The issue for all of us concerned native Filipinos is not who is/are the worst public thieves. The issue is why we the so-called educated native Filipinos allow these crimes to happen. It seems we native Filipinos have given up any real struggle for fundamental changes and social justice. It seems we native Filipinos are the only people on earth who allow known, elected officials and their minions to steal our public coffers, to commit crime with impunity, to not only let them remain free; but also to continue and/or return to rule us. And therefore, knowing these facts we natives deserve to be doomed throughout our remaining years; and unwittingly we doom our future generations unless we wake up and act --not only for economic and political changes-- but also for the fundamentally necessary, radical, social transformation. In below article on corruption, the late I. P. Soliongco again provides us with his easily understandable and critically analyzed observations of Philippine society of his time; all of which still resonate with much relevance more than two generations today; all of which indicate that nothing has fundamentally changed for the betterment of our native majority. To the foreigner and the not critically-thinking, or lazy native Filipino, who see and conclude that corruption is in our blood, a part of our Filipino culture, i.e. our so-called “culture of corruption.” I strongly disagree. I agree with Soliongco who saw corruption in our homeland, in all its manifestations, as a symptom and not a root cause of our perpetual poverty, despite our many highly educated natives and rich, though diminished, natural resources. Essentially, we native Filipinos need to identify and critically examine these internal/cultural obstacles to progressive changes --in addition to the historical and current external/foreign influences and pressures covertly and overtly imposed on us. I believe many so-called educated among us know such need; but because they profit from the status quo, do not have empathy and identification with the native majority (another indication of our society's elite class mentality), they do not work for the common good. For those native Filipinos who do, I invite you to read, to know and to have a deeper appreciation of graft and corruption in our homeland. As always, the past helps us to understand the present; to plan and to act. A friend of ours for whose views we have the highest respect has taken exception to the observation we made in this place the other day that the long experience of the Filipinos under colonial rule is an explanation but not an excuse for the rampant corruption in Filipino society. Such an experience, our friend argued with singular passion, has nothing to do with the present behavior of the Filipinos, and how they act as a manifestation of an aberration in character and not the product of historical forces. However all this may be, the fact stands out that the so-called aberration in the Filipino character can not be congenital, for if it is, then the Filipino are cursed indeed and do not deserve to survive, much less to prevail. They re fated to scrounge to be able to live, to have masters and to be burdened with what Nietzsche once called the "morality of the serf." But we prefer to think that no people, not even the Filipinos, were ever created with so fatal an affliction. And while the fault of what they are lies partly in themselves, the truth that must be admitted in fairness is that part of that fault lies in their past. That past conditions their present; and explains the curious ambivalence of their character. One of the most common accusations hurled at the Filipinos by foreigners who know no better is that their obsession is financial security to the satisfaction of which they have so sacrificed their sense of right and wrong that to them the most immoral transactions have become pardonable. second by the financial and social success of those who have no concept of honor and honesty. The ugly result of this process is that unlike the members of the more secure societies, societies in which respect for law and convention is the condition precedent to survival and success, the mass of Filipinos have little, if any, capacity for moral indignation. They are not capable of, say, the same passion and hatred which animated the French in 1934 when France was wracked by the Stavinsky Scandal. But this singular tolerant attitude of the Filipinos toward matters which in other places would goad officials to suicide and cause governments to fall stems from the cavalier manner in which they regard the law. And this cavalier manner in turn is the consequence of the experience of the race under an odious colonial system (of Spain and partly of the U.S.A.) in which laws were proclaimed and traditions developed for the protection and exclusive benefit of the rulers. In this circumstance, the Filipinos were forced to look upon law as an impediment to their survival and, as a corollary, to look upon the violation of law as a necessary virtue. (Their behavior during the Japanese occupation is too recent to need elaboration.) Finally, in a situation which subsisted for more than four centuries and in which they were at the poor receiving end of a lopsided colonial economic arrangement, the Filipinos could not help being obsessed with the logical desire of capturing in the best way open to them what they considered their rightful share of the proceeds. It can be argued, of course, that these conditions we have described have been cancelled by the fact that the country is now sovereign unto itself. On the theoretical plane, this can not be denied. But on the practical level, the truth is less rosy. For the truth is for 16 years after independence, the Filipinos are still the economically weak majority in their own land. Thus, unless they wrench themselves forcibly from the economic chain and emerge as the economically dominant majority, they have little choice but to hold unto those values and standards which had enabled their forebears to survive colonial rule. The Liberal candidates, from Vice President Macapagal and former Senator Pelaez to the congressional aspirant, have based their campaign on graft and corruption, almost to the exclusion of other and more basic issues. They have done so, for graft and corruption as a political issue has a power impart to those who use it as a sense of self-righteousness. More, it has a way of inflaming the multitude and robbing it of whatever analytical capacity it might have. Now, graft and corruption are an evil, and as an evil it has no place in a well-ordered society. It should arouse our moral indignation but not to the point where we are rendered blind to its social and historical context. In its Philippine setting, the issue of graft and corruption is not the police problem that the Liberals have tried to paint it. Its solution cannot be found in the customary Macapagal exhortation about putting the erring Cabinet Secretary or the merest crooked clerk behind bars. The solution that the Vice President suggests may be effective for dramatizing his claims. But we are certain that it will not solve the problem. At the risk of incurring the displeasure of those who contend that nationalism and corruption are two distinct and separate issues and that the first has been rendered meaningless by the second, we would like to advance the minority view that in a country like the Philippines, a country which has been a colony for more than four centuries and which gained its freedom in a somewhat imperfect fashion only the other day, the two --nationalism and corruption-- are inextricably bound together. To put it more accurately, corruption is the necessary consequence of a system where colonial and not nationalistic values prevail. Our experience during the Japanese occupation should shed light on the intimate link between a colonial order and corruption. During that time, the Filipinos considered it a virtue to rob and cheat the Japanese not only on the ground that the Japanese were the enemy but on the more cogent ground that the fruits of their farms and of their labor were appropriated by the invaders. Our experience with the Japanese is the telescoped of our centuries of experience with our former rulers. The values, therefore, which we had developed during those centuries are a result of that experience and have become ingrained in us. We suggest that it is not likely that we can do away with them at the snap of VP Macapagal’s finger. But the more important reason is that the conditions which once formed the background for, and the justification of, those values are still partly in existence today. To the credit of the Nacionalistas, they have not allowed themselves to be carried away by the popular clamor “Off with their heads!” They have conducted a punitive drive against the grafters and thieves in the government, but at the same time they have endeavored to remove the causes of thievery and graft by the hard but necessary expedient of implementing a nationalistic economic program. We can not help but be confused these days. We do not have the certainty that most of our friends have and so we are less capable than they are of forming ready conclusions. Our friends have all come out thumping their chests, in a manner of speaking, and condemning, with all the fury of the Old Testament, those who are now accused of graft and corruption. Perhaps, we are as sure as they are that these government officials are as guilty as anything, but then, we are struck by the rather consistent international pattern of this decadence. We seem to remember that graft and corruption have also pervaded the officialdom of China and in the republics of South and central America. We need not even mention here the same corruption in Europe and elsewhere --even in Japan under the strong, puritanical arm of General Douglas MacArthur and General Courtney Whitney. We have observed that this epidemic of scandals has struck with more or less the same virulence those regions where imperialism is in the process of strengthening its hold. We have studied the matter a little more thoroughly than is our wont and we seem to see a logical pattern running through the whole thing. We seem to see also, that graft follows rather closely the graph of the rise and fall of the imperialist advance. And then we recall the corruption of the Kuomintang, of the army and business cliques in South America, of the tremendous power they wield and the influential positions they hold. These groups, we find, are not the groups identified with the real nationalist movements in their respective countries. Rather, they are identified too closely with those who are ready to dispense patronage and protection to foreign interests. In the Philippines, those who profited from corruption, those who received bribes in the form of concessions from the FLC and the USCC, and later, from the Surplus Commission, are those who worked faithfully for the passage of Parity and the approval of the Bell Trade Relations Act. Today, when they have become so corrupt, they have ceased to be of any use to imperialism. They have become, instead, a definite liability. And they must be stopped. To oust them from power, another group must be supported and encouraged. The process will go on and you may be sure that imperialism is always prepared to resolve the dilemma of corruption. It knows from experience that corruption is dynamic, that it progresses like cancer until its victim becomes useless even for the purpose of puppetry. The solution is to transfer allegiance to an incorruptible group, relatively speaking. It is no doubt an intellectually exhilarating exercise to trace corruption in a developing country like the Philippines to its sociological and economic roots. This was done the other day by four lecturers who are in Manila to acquaint business writers with the nuances of their chosen field. Like medical doctors in consultation over the ailment of a fast deteriorating patient, the four --one a Ceylonese, one an Indian, one an Englishman, and the last a Filipino-- discussed at length and in detail the causes and the nature of graft and corruption in Philippine society. Each, as only to be expected, has his own diagnosis and cure, but all are agreed on the seldom accepted proposition that corruption in the Philippines, whether private or official, is due to the state of scarcity which bedevils, the Filipino in the mass. This means that because of the marginal existence of the vast masses of Filipinos --the existence of which is based on two meals a day and on a forlorn hope for a bright future-- corruption has become a way of life. 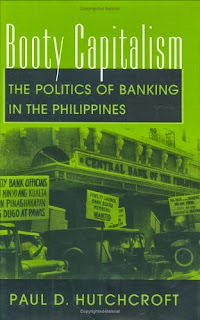 But the significant distinction which the lecturers made --significant in the sense that it is justified by the actuality in the Philippines-- is that most of the corruption here may be found, not in the barrios or in the isolated clusters of hamlets in the remote areas, but in the superbly paved and air-conditioned ghettos of politicians and tycoons. By these, I imagine, the lecturers meant the members of the elite, the decision-makers who, in developing regions of the earth, usually compose a monolith class and its ancillary groups. Then the lecturers pointed to another level of corruption, the corruption which involves the transfer of purchasing power --cash for short-- from one hand to another in the bureaucracy and in the lower echelons of the business and political world. No remedy was suggested to cure the evil which has made the elite that much more reprehensible, but to erase the corruption to which the bureaucracy is addicted, the suggestion was made that economic development should be the immediate goal in order to do away with the state of scarcity. In other words, industries should be developed, the vast natural resources of the country exploited, and the agricultural lands rendered more productive if members of the bureaucracy and the people who compose the lower-middle class are to have their just share of the national wealth and in quantities that will make them antagonistic to any form of corruption. As an ordinary layman who is interested in the emergence of a safe and economically secure society, I cannot possibly have any quarrel with the solutions suggested by the four lecturers. For surely, the acquisition of professional pride on the part of the members of the bureaucracy and the abolition of the economy of scarcity will bring us nearer to the preconceived sunlit uplands. But before the sunlit uplands are reached --before,to express it in other words, the economy of scarcity is abolished-- it is necessary to remove the impediments. Unfortunately, the biggest impediments to the attainment of a secure society are precisely the forms of corruption which prevail in the Philippines today. What this means is that the forms of corruption placed under scrutiny --bribery, nepotism, extortion, etc.-- are the insuperable obstacles to industrialization, professionalism, a sound civil service system, and general competence. It is for this reason that I incline more to the notion that the most drastic changes should be instituted in that echelon where those who wield real and effective power are well entrenched. This done, it would be easy to effect reforms in the bureaucracy, in the lower middle class and certainly in that group of the debased proletariat. Removing corruption in government is not as simple as raising a howl about it or raiding its den. Nor can it be removed by changing one set of officials with another set but without altering the internal and external policies of government. For instance, it is difficult to conceive that our present crop of rulers derive their powers and support from the people. While it is true that these men owe their election to a nominal majority of votes, it cannot be denied that their entrance to office was made under a cloud. Even if it is admitted that there was a real majority which won them their office, yet no one can deny that their corruption from the date of their election to the present has been progressive. The reason is that their services to the economically powerful can only be purchased at the price allowing them to help themselves to the public till. Since they cannot possibly go to the people for support, they rely on the economic interests they serve for maintaining them in power. And since, further, they know that their tenure is necessarily limited, the logic of the situation compels them to be more corrupt, if only to make the most of their opportunities. a lot of other profitable sidelines which foreign interests can afford to dispense. Whoever is the mastermind behind the racketeering on junior and senior teachers’ civil service examination questions deserves commendation for his or her keen business acumen. We would advise the authorities to go easy on him or her and to consider the circumstances surrounding the commission of the alleged crime. One thing should be obvious to the authorities: no person with any business sense will indulge in a racket which does not have a rich market. We contend that whoever is responsible for the leakage of the test questions took the risk of violating the law because he saw how eager the candidates were to pay for the questions in order to pass the examinations. In other words, the teachers, the very people, by the way, who are entrusted with the training and education of the nation’s children, provided the encouragement for the racket. It is reported that a number of them have already parted with their savings just to get hold of a set of the test questions. This is how eager they are to qualify as junior or senior teachers. This is a very natural desire, of course. But what is infuriating is that these teachers, who in the classroom preach honesty and catch with eager eyes pupils, who cheat, are themselves guilty of the very crimes they try to abolish. we wonder what a child would think if he were to know that his teacher passed a government examination because he had secured the questions in advance. And we wonder what a teacher of this type would tell a student caught cheating at examinations. We have seen the type of questions usually asked in civil service tests. The other night we saw a sample set for senior teachers. It is doubtful if even a handful of teachers can give the correct answers. And we shall never know where the examiner got the questions. Among the many catchwords invented by the present dispensation to distinguish it in quality and purpose from its predecessor, the most widely used, the one that is intended to clinch any argument over superiority, is moral regeneration. In these hectic days of political campaign, it is often on the lips of candidates and their leaders, as if the act of uttering it was sufficient to establish the moral ascendancy of even the reprobate. But moral regeneration is a sumptuous phrase of vast and intricate connotation. It is a phrase which can not easily come to the lips of the great majority of our politicians, for in its real sense, moral regeneration cannot be confined to the mere abolition of, say, that petty thievery that used to be a major feature in the daily lives of government employees and officials. It can not merely refer to the abandonment of the habit of filing spurious tax declarations or of the practice of avoiding the payment of customs duties on taxable goods. All this, we suppose, is desirable, for at the very least the resources of the government would not be impaired if thieveries were stopped and taxes paid. And in so hard up a government as ours, the conservation of financial resources is almost an accomplishment in itself. But a meticulous observance of the petty morality of the small man and of the village preacher --and this simply means the elevation of the honesty of the clerk to the category of an all-encompassing virtue-- is likely to detract the attention of the people from the other and perhaps more valid and more enduring aspects of moral regeneration. and many other practice and habit of the mind and spirit known to all civilized men. In a word, what we would have is a Calvinistic society where the conversion of thieving clerks into little honest angels was an end in itself and which could be used to hide the more pervasive immorality of destroying the grace of justice and fairness. We should all rejoice, of course, that according to official reports, there are less thieves in government than used to be. By all means let us celebrate the newly acquired sense of petty honesty of the small men. NOTE: As alluded to in the Preface of the source book: Mr. Indalecio (Yeyeng) P. Soliongco was editorial writer/columnist of the Manila Chronicle from the late 1940s to 1971. He wrote over 8000 columns in his "Seriously Speaking" column. He discussed various subjects but concentrating on day-to-day sociopolitical developments; exposing the hypocrisy, lack of intellectual and moral integrity of many public figures. "Corruption is worse than prostitution. The latter might endanger the morals of an individual; the former invariably endangers the morals of the entire country." - Karl Kraus, 1874-1936. Many thanks for this 1961 essay of I.P. Soliongco, one of the best Filipino essayists and columnists, our country has produced. It is remarkable that before martial law, from the 1940s to the 60s, we have produced so many nationalist writers in media. You don't see the likes of them anymore. In fact, nationalism has become a bad word. From my high school up to 1972 when the Chronicle was shuttered, I.P. has been one of my favorite columnists. He was a friend and confidant of Laurel, Recto, Tanada and Diokno, the uncompromising nationalists from the 1940s. It is noteworthy, as I.P. has pointed out, that the nationalist politicians, despite their long tenure in politics, had never been tainted by corruption. Not even President Garcia whom Macapagal had successfully tainted with the false veneer of corruption died a poor man. His only possession after he retired was a modest house on Bohol Avenue here in Quezon City which he probably bought when real estate prices were still ridiculously low. On the other hand, Diosdado Macapagal, father of the disgraced Glora, died in a mansion at Forbes Park despite his pretensions of being the "Poor Boy from Lubao." It was Macapagal who scrapped the nationalist economic policies of Garcia that ushered us in the 1950s to second place to Japan in economic development. Macapagal toppled Garcia with the financial help of the foreign chambers of commerce, led by American Chamber of Commerce in the Philippines. Today one who espouses economic nationalism or Filipino-first in industry, commerce and agriculture would not go far in business, politics and the academe. He would be ostracized by the elite and foreign dominated corporations and businesses. And yet our neighbors in China, South Korea, Singapore, Taiwan and Japan have prospered because their governments have supported indigenous businesses against unfair foreign competition, giving them subsidies and other assistance to promote their survival. We have been at this for 500 years - half a millennium. Our evident failure have not opened the eyes and minds of our elite masters. Thank you for your feedback! I fully agree with your comments. I add that our socio-economic elite, who also comprise mostly the political elite, are not ignorant; but simply ignore and do not want to plan and act for the necessary fundamental reforms/social transformation as these are against their selfish interests. I will soon transcribe and publish Soliongco's essay on Diosdado Macapagal.